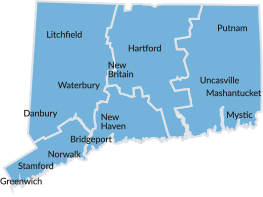 The Central Regional Tourism District promotes Connecticut's River Valley/Greater Hartford and Greater New Haven region as a vacation and sight-seeing destinations for visitors to the New England region. It stretches from the Massachusetts border to Hartford, along the CT River to New Haven and its neighboring shoreline towns. The Connecticut River, centerpiece of the River Valley region, soothingly meanders from Suffield to Old Saybrook. Along the way, visitors can stop in Hartford, the Constitution State’s Capital, for a glimpse of Connecticut’s history, or explore the River Valley for rest, relaxation and family fun.